Accommodating growth in travel demand in ways that contribute to smarter growth requires guidelines for interrelated land use and transportation planning. Examples of building blocks that influence achieving smart growth are shown in Figure 5.1. Increasing population densities through intensification of land use along corridors that can justify better levels of transit service. Similarly, concentrating employment in centres that can support better levels of transit service. Approving local urban design and development plans that facilitate access by transit vehicles without circuitous routing, as well as encourage walking and bicycling for short trips. Encouraging employers, including government agencies, to support transit use and car pooling rather than individual free parking and car allowances. Striving for mixed land use that reduces travel distances (and thus total vehicle-km of travel) for a variety of trips such as the journey to work and access to commercial, shopping, recreational, education, and health services. Rationalizing land use planning among separate jurisdictions to create a region-wide master plan for growth management. 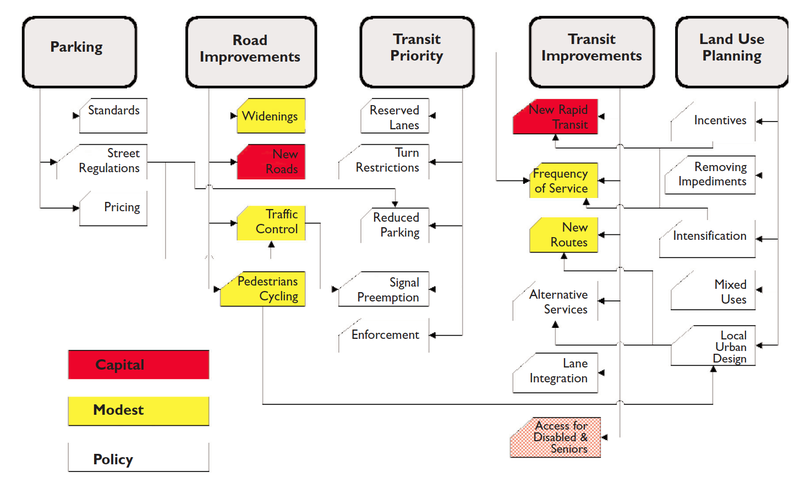 Modifying traffic engineering criteria to give higher priority to pedestrians, cyclists, and transit vehicles. Reducing transportation emissions related to particulates and greenhouse gases (through pricing, taxation, and fuel consumption standards). Using cost-effective, and not necessarily capital-intensive, technologies for new transit services that are appropriate for anticipated levels of use and which deal with both ends of trips. Increasing the productivity of transit vehicles and transit labour through priority measures and advances in information technology that increase average transit operating speeds. Enhancing the coverage of transit services by introducing innovative, alternative forms of service delivery that complement the mainline components of the transit network. Eliminating barriers to the use of transit that derive from jurisdictional boundaries to create seamless transit from the standpoint of potential users. Introducing road pricing as a means of altering travel behaviour and the choice of vehicles, as well as a source of transit funding. Altering transit subsidy programs to reward performance rather than costs, thereby creating incentives to attract higher ridership. Providing municipalities and transit agencies with new sources of predictable revenue other than property taxes.